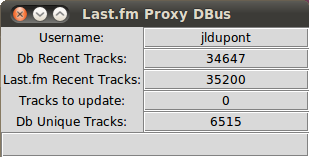 "lastfm-proxy-dbus" is a Linux Ubuntu/Debian application providing a DBus interface to a user's Last.fm "user.recenttracks" journal. This application is used by "Rhythmbox Sync with Last.fm": more information can be found here. The application fetches the "recent tracks" journal from a Last.fm user. The journal must be made public by the user. Each journal entry is kept in a local database (in ~/). The application then sifts through the journal entries and updates the a table of "unique tracks" in the local database. Lastly, the application fetches the MBID (musicbrainz identifier) associated with each "unique track" thereby facilitating the correlation between a local music file and remotely scrobbled ones (e.g. from an iPod). The application shows a "Tracks to update" indicator: the number of tracks left to process before entering a "dormant state". The indicator "Last.fm Recent Tracks" is just an approximation. This application works best in conjunction with musicbrainz-proxy-dbus. Once the application is installed, it will be available through the Application --> Other menu item. This application requires that Rhythmbox's Last.fm be configured with the user's Last.fm account information. If the a "403 forbidden message" appears in the user message box, it is probably due to the privacy settings associated with the Last.fm user account.